To estimate annual life tables by county from 1980 to 2014; describe trends in geographic inequalities in life expectancy and age-specific risk of death; and assess the proportion of variation in life expectancy explained by variation in socioeconomic and race/ethnicity factors; behavioral and metabolic risk factors, and health care factors. Annual county-level life tables were constructed using small area estimation methods from deidentified death records from the National Center for Health Statistics (NCHS), and population counts from the US Census Bureau, NCHS, and the Human Mortality Database. Measures of geographic inequality in life expectancy and age-specific mortality risk were calculated. Principal component analysis and ordinary least squares regression were used to examine the county-level association between life expectancy and socioeconomic and race/ethnicity factors, behavioral and metabolic risk factors, and health risk factors. 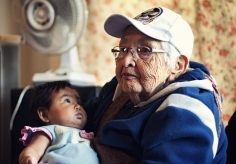 In 2014, life expectancy at birth for both sexes combined was 79.1 (95% uncertainty interval [UI], 79.0-79.1) years overall, but differed by 20.1 (95% UI, 19.1-21.3) years between the counties with the lowest and highest life expectancy. Absolute geographic inequality in life expectancy increased between 1980 and 2014. Over the same period, absolute geographic inequality in the risk of death decreased among children and adolescents, but increased among older adults. Socioeconomic and race/ethnicity factors, behavioral and metabolic risk factors, and health care factors explained 60%, 74%, and 27% of county-level variation in life expectancy, respectively. Combined, these factors explained 74% of this variation. Most of the association between socioeconomic and race/ethnicity factors and life expectancy was mediated through behavioral and metabolic risk factors. 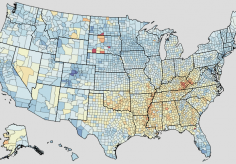 Geographic disparities in life expectancy among counties are large and increasing. Much of the variation in life expectancy among counties can be explained by a combination of socioeconomic and race/ethnicity factors, behavioral and metabolic risk factors, and health care factors. Policy action targeting socioeconomic factors and behavioral and metabolic risk factors may help reverse the trend of increasing disparities in life expectancy in the United States. United States Life Expectancy and Age-specific Mortality Risk by County 1980-2014”.